WordPress is for blogging. Drupal is too complicated for beginners. Joomla is something between these two. These are the key features that we know about the most popular content management systems – WordPress, Drupal and Joomla. Not much. Especially if you want to create more than one web site with different design and options included. Let’s try to look through the details that help you to choose the content management system that is easy-to-work with and that will meet all your requirements. Everything is about your preferences. Some users suppose that Joomla is slow while others think that it is Drupal that takes more time to load pages. Here you can compare the most important factors that are necessary to take into consideration while creating your website. Of course, there can be more than 20 features need to be covered. Feel free to add some new and important as well as just share your own opinion. 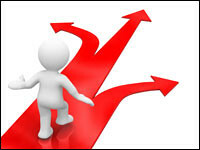 If all you need is a decent blog, choose WordPress without hesitation. It is easy-to-use CMS with plenty of fantastic themes to make your blog look great. WordPress has a good categorization system with tags and categories. To create SEO friendly pages is also easy indicating special title and URLS for every unique page. WordPress is not only about blogging. Using this CMS you can create a static website as well. It is the best solution for beginners who want to create some small website or blog. Easy to learn, simple to use. Plenty of features to try. What else do you need? 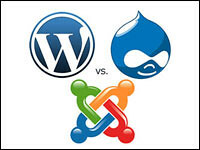 Joomla is considered to be something between Drupal and WordPress. It has more features than WordPress and is not so sophisticated as Drupal. With a great collection of various extensions, Joomla can be used to create websites including online shops. There are lots of features, but they are easy to learn. You can use it for blog as well, but categorization is limited. On the whole, Joomla is for those who tired of WordPress, need some improvement or something new, and are not ready for Drupal. Middel-sized projects can be created with Joomla. Drupal is perfect… but hard. Some programming knowledge is a must. If you are confident in your development skills, choose this CMS for sure. Tons of features for blogging, social networking, forums, communities, online shops. It has all you dreamt about. As they say “The more you sweat in training, the less you bleed in war”. Drupal is all about it. To learn it is hard, but with all its features provided and vast community that is ready to help you, to create any complicated website with plenty of features will be possible. The other question is whether you really need it? Maybe simple and user-friendly point-and-click interface is better than content management system that requires some technical skills.